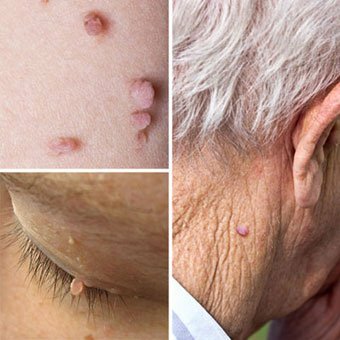 Skin tags are projections of smooth or irregular skin, flesh-coloured or more deeply pigmented, projecting from surrounding skin, often connected by a narrow stalk to the surrounding skin. They often appear around the eyelids, neck, groin, underarms and under the breasts. They are usually painless, but may become irritated and itchy. They also often “catch” on necklaces or rub against the braline. This is a common benign skin lesion which we routinely remove either utilising liquid nitrogen or a snip excision.